We offer a comprehensive and professional TV wall mounting service. We guarantee to be able to wall mount any size or brand of flat screen TV to most walls and surfaces. With years of experience of wall mounting you can be assured that your TV will be secure, safe and positioned correctly. 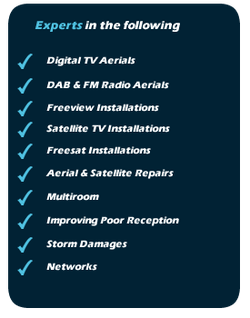 Multiroom systems can vary from an additional TV aerial outlet point perhaps in one extra room to a more complex TV system, incorporating multiple satellite receivers or satellite playback with remote control throughout your property. Many consumers now own multiple HD televisions. You can get the best viewing experience by watching all of your favorite programs in stunning HD throughout your property. If you need to protect your property with CCTV we can choose and install the best system that meets your requirements at the best price. Contact us today to discuss your requirements and to get a free quotation. If you need additional telephone sockets in you property for telephones or broadband we can install these wherever needed. If you need to address multiple people over a wide area we can provide the perfect PA solution to meet your needs. If your wireless router isn't powerful enough to cover your entire property we can extend the wireless range to ensure your property including out buildings have full coverage. We can also install cat5e/cat6 structured cabling for all your network requirements.